There is the world's greatest street sale going on today on South Huxley in Cheektowaga. Unbelievable amounts of stuff! That is a picture I took above when I was waiting for my mother to finish scouring one of the first sales we went to. Observe the creative use made out of the "No Parking" sign. That I admire! Click on the picture if you need to see it in more detail. The great thing about writing a Web log is that when life gives you lemons you can make lemonade. Instead of getting bored or irritable you can take pictures. For instance there is my mom's search for a television. This drama has actually been going on for weeks. And zut alors, I am no help. I do not understand modern TV! The cable or digital question, I have no idea at all. They may as well be speaking Urdu. That is how much I understand. At home I cannot even turn on the TV. That is the truth. I have no idea how to change the channel or what channel is where. I do not know where to begin. If Howard is not home I do not turn on the TV. It is that simple. But my mother has thrown herself into modern television technology and she talks to me about it all the time, while I stand there like this. Ha, ha! You know those buffalo you see at the zoo? Howard and I were looking at one just yesterday. Not a thought in their heads! "Good buffalo," Howard kept crooning to the bison. "You're a good boy. Yes, you're a good boy!" 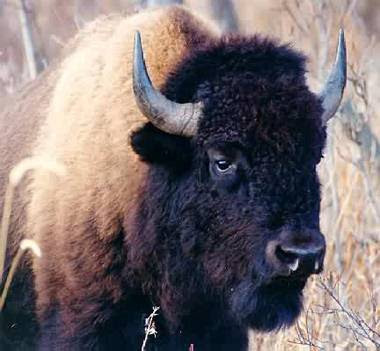 And the bison would turn its head ever so slowly and peek at us with its great vacant eyes. That is how I was looking on as my mother examined a television on Huxley. You were supposed to make an offer but the big question was, did it work? Someone brought out an extension cord and the TV was plugged in. But all they could get was static! Was this because we were outside? Or because you needed some kind of cable and they did not have it? Or was it something relating to digital technology? As these questions were pondered, 10 or 20 minutes passed. Instead of getting bored or irritable I took pictures! This is my favorite. Unfortunately a split second after I took that picture the guy in the cream-colored shirt in the foreground assisting my mother turned around and caught me with my camera. That was not pleasant! I tried to act casual and say I was taking pictures for my Web log. Then I had to lie low for a little while. Now here is the moment everyone is waiting for. The haul! There were two boxes of vinyl which I could tell right away was quality. I should have just offered $10 for all of it but my mother would have flipped. As it was she was not happy when she caught me looking through it. "Look at you, you're in heaven," she snapped. I was standing there red-handed with Stravinsky's "The Rite of Spring," conducted by Pierre Monteux. Leonard Pennario loved playing with Monteux and he taught me how to pronounce Monteux's name so now I do it with confidence. It is "Mon-TER"! That is close enough anyhow. Also I got Heifetz playing the Brahms concerto with Fritz Reiner. Other stuff I got: four tank tops I can wear for workouts (25 cents each); a frying pan (50 cents); and a beautiful long silk wrap skirt ($3). My mom thinks the skirt is kind of loud but I will figure out some place to wear it. Thinking back on the afternoon now, I am haunted by things I passed up. But next week brings another Saturday and tomorrow is another day! There is no doubt in my mind that you were in hog err buffalo heaven! Sadly, those pictures remind me of my back yard. Sad, because I am not having a sale! That is some great music you scored! Pedantry: Pierre Monteaux was the conductor who premiered the Rite of Spring and endured the riot it set off. If you didn't know, you do now. OMG ... your story is hilarious. I love the buffalo reference. I am exactly the same - ignorant, vacant and mute. I know almost nothing about dig. tech and don't care to. We don't watch TV, we don't have cable. We occ. watch a DVD. And I don't care to text or twitter or whatever.